There are a significant number of 21st century cultural properties that have been elevated to cult status through canonisation in the online world of memes and GIFs: some deservedly (Muppets Most Wanted, The Cat in the Hat); some not so much (the entire filmographies of Shia LaBoeuf and M. Night Shyamalan). Yet nothing, NOTHING, has come to rule the collective hearts of my generation (b. 1997, graduated high school 2015/2016) like the Shrek franchise. Now the Shrek films are undoubtedly great family comedies (I’d rank ‘em 2–3–1–4, fight me! ), but do they deserve their position as the de facto Favourite Kids’ Films of today’s twentysomethings; this century’s Mary Poppins or Raiders of the Lost Ark? I’m not so sure they do. After all, we’re talking about four 90-minute comedies filled with overt scatology, tiresome (and now dated) pop culture references and a handful of cross-dressing jokes that seem a little un-PC in the current climate (Shrek 2, the best of the series, was only the 4th best animated film of 2004, thanks to The Incredibles, The Polar Express and the first Spongebob movie). Nonetheless, it’s perfectly easy to understand why they’ve aged so well in the memories, and in the Shitposting groups, of my peers. 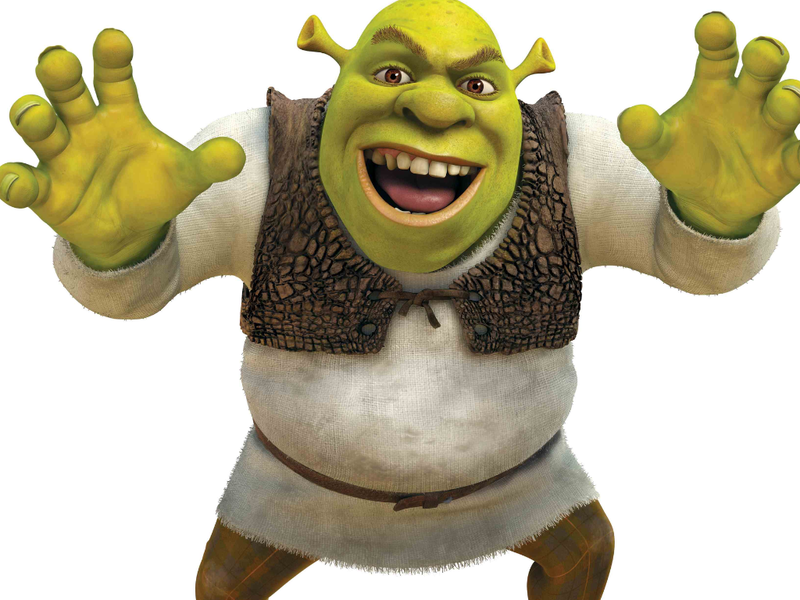 Firstly, the Shrek voice cast is an assembly of comedians who entertained and amused previous generations to no end: Mike Myers’ Austin Powers was the Shrek of the 1990s (if only there were memes back then), Eddie Murphy was a box office champ for almost two decades before the first Shrek, while Monty Python’s Eric Idle and John Cleese, Dame Julie Andrews, Millennial multihyphenate Justin Timberlake, Jennifer Saunders and Antonio Banderas all contribute to the series. Myers must now regret putting all his proverbial eggs in the family comedy basket in the early 00s, it essentially killed his film career, but at the time it must’ve seemed like a win-win: keeping his name alive, be it printed above the image of an animated ogre, and raking in big cash for minimal work. What has allowed the Shrek meme phenomenon to explode so broadly is the series’ relative lack of self-reflexive comedy. In smaller circles, I experience a dedicated meme culture around Community, Arrested Development, 30 Rock, SpongeBob Squarepants and such (and, conversely, the mocking of the Star Wars prequels’ pofacedness), but buying into ‘the joke’ in the case of these shows requires a lot more time and commitment than with Shrek. It’s pretty hard to keep up with what’s currently the in vogue theme of Spongebob memes; whereas in Shrek’s case, the pool of concepts is fairly narrow. The quotes are known far and wide, because everybody watched the films hundreds of times in their infancy. The selection of music in the Shrek films, largely chosen to facilitate an Original Motion Picture Soundtrack CD release, sometimes borders on absurd in its heavy-handedness and contrast to the levity of the story. Smash Mouth’s “All Star” is the most obvious example of a breakout track from the Shrek soundtrack, but there are endless potential jokes about the unnecessarily serious choices elsewhere: “Hallelujah”, “Changes”… the list goes on. Shrek hits an endearing sweet-spot between knowingness and naiveté, it’s a franchise it’s impossible not to feel warmly towards. A fifth Shrek is supposedly in the works; it’ll likely be my generation’s equivalent of the Trainspotting sequel or the Twin Peaks revival. And it will surely provide us with thousands of new memes.